How did it take me so long to read this one?! I bought Crazy Rich Asians when it came out and my TBR list being an ever growing thing because I keep finding things I want to read, it languished. 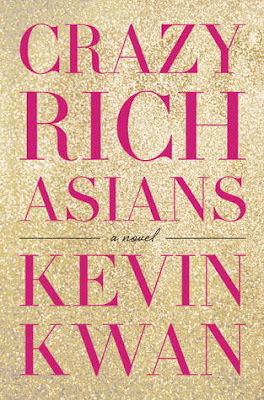 I was reminded of it when China Rich Girlfriend debuted but instead of reading it then, I bought CRG and they languished together. 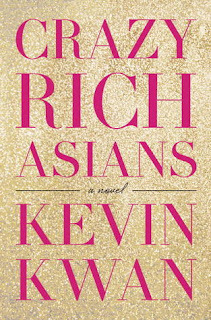 Last week I read a novel set in China that I loved so well, I determined to finally, FINALLY get what Kevin Kwan wrote in my brain. And it was good. Economics professor, Rachel Chu of New York is invited by boyfriend, Nicholas Young (history professor) of Singapore to the wedding of his best friend Colin Khoo to Araminta Lee. Not that it sounds so simple to invite the Significant Other to a wedding, but this unfurls as a thing so complicated it reads as tantamount to an international incident. Nicholas comes from a family of dynastic wealth. The real sort, where it's so deep and far reaching that the social media driven world has never heard of them and more to the point, doesn't see them. Where their property is obscured on Google Maps and reads blank on a range of satellite imaging. I'm a sucker for a story about people who know the true value and power of anonymity and privacy so this captivated me straight away. This is not to say that all of Nick's extended family are about privacy & eschewing ostentatious displays of wealth. There's a cast of true characters that follows in this family that run the gamut from eccentric (hello, Oliver!) to soulless (I'm looking at you, Eddie!). Like all cloistered enclaves, there's a lot of competition between the old money guard and the nouveau riche are attempting not just to get a foot in but also to learn the rules and if they can pull it off, break and remake some. It all adds up to a sometimes dizzying game. Upon finding out Nicholas is bringing Rachel home to meet the family, his mother, Eleanor, spends the first half of the book avoiding meeting Rachel & on a quest to find out something scandalous about Rachel that I was sure would either be a lie or something Rachel herself had no knowledge of (did anyone believe her mother's story that Rachel's father was dead?). She even gets a sort of Mean Girl brigade to try to do some damage to Rachel & Nick's relationship. Nick's father spends as much of his of his time as he can in Australia away from his wife. No one sane or kind can blame him for that. Cousin Astrid was a great character and had an interesting story going on herself. She married Michael who isn't from a wealthy family and the differences between the families status has taken its toll on her husband. While I felt for Michael, I have to say that the most romantic gesture in the story is done by Charlie, Astrid's ex-fiancee. The lengths he went to, anonymously, to help foster her happiness and marital success was lovely. It was illegal but grand. Cousin Eddie (brother to Alistair & Cecelia) is married to Fiona & they have 3 children (Constantine, Augustine, and Kalliste). He maintains spread sheets detailing his family's wealth & how much he'll inherit that he updates weekly as he waits for his grandmother to kick. He's a gaping maw of emptiness that is trying to fill in with designer brands. He fails. I think he was supposed to be a bit of a comedic foil but as I found him abusive to his family, so that fell flat. Rachel luckily had some allies along the way. Piek Li, a friend from college, is from a nouveau riche family of builders. Her father is all kinds of put out about the Young property that Google dark. Her mom has three portly Pekingese dogs names Astor, Trump & Vanderbilt and has a penchant for gold covered everything. It hurt to read but their kindness won out over their taste challenges. I hope to see more of them in the following books. In addition to Piek Li, Astrid and Colin's cousin Sophie were also helpful to Rachel along the way and I hope they all grow closer. Cloistered enclaves, no matter where they are, tend to be suffocating & limited petri dishes where nothing much is as great a pass time as gossip, back-stabbing and envy. Next level schadenfreude is happening. The descriptions of the opulence here didn't court my envy but the descriptions & variety of food did. I want a gastronome touring package holiday in Singapore with a side jaunt to Malay! One slight criticism I have is that Rachel & Nicholas' angst sometimes read as teens and not the 29 & 32 year-olds they are. This problem extended a bit to the bachelorette guests (Francesca and Amanda specifically) as well. I had to keep reminding myself that these "girls" were full grown degreed women. The ending wasn't one so much as it was a scene cut. I can't be the only reader who hoped to actually see Nick propose to Rachel. I have the second book in my TBR pile so at least I can continue with the story immediately. This was compulsive reading at its best. Definitely recommended.